A hand saw is a well known woodworkers hand tool. The five best hand saws reviewed and compared. There's a variety of hand saws availble, all of which can be applied to different tasks. From miter saws to chop saws, coping saws and more - and that's without the material you're using them on. Wood, metal, plastics - all require a different type of blade. For a woodworker, a saw of any kind is one of those tools that you can't seem to go a day without using. Despite the difference in price range that you'll find amongh some of the hand tools, a good saw will deliver a clean accurate cut, and leave the kind of finish that makes the rest of the work a lot easier. The five best hand saws are featured below. They're top selling saws and highly rated for their value for money and quality manufacture. This is the bests selling hand saw overall - and a great saw for working on drywall. One of many Stanley tools, the large serrated teeth and ergonomic design make it both comfortable and capable. The teeth are induction hardened so they cut through drywall like a hot knife through butter and the narrow front and overall shape makes it a nice tool for creating holes in drywall. It's equally useful with plastics and wood as the blade is surprising solid and the slip-resistant handle does is exactly that. This is a well made general purpose cheap hand saw - impressive, affordable and highly rated. One to buy for the tool box. This is the best power hand saw - it's versatile, labor saving and relatively cheap for a power tool. It's one of those tools that you can apply to a variety of tasks - wood cutting, plastic pipework, and more. Not an industrial strength saw in my opinion but it's definitely capable of being a great fall back tool on construction sites and remodeling projects. It's a corded model, pretty compact and it's driven by a 3.4 amp. The blade is solid enough and used on a pile of medium sized branches that needed cutting down to size, it delivered impressively enough. Comes with a bag and two blades - one large, one metal cutting - and won't cost blow a hole in the budget. This is the best selling hand saw that's more for wood cutting - and comes from Stanley Tools. The blade is 15" long, with induction hardened teeth that will power through trees, roots, brush and similar. It's also just as good at cutting up 2 by pieces, PVC, MDF and what it cuts - it cuts accurately. There's a good balanced feel to it when you're working, it doesn't drag or expect you to do all the work. Used with the correct technique it rips through anything you use it on and I'd recommend it as the best saw for handling anything related to tree cutting. The blade doesn't flex, the handle does what it's designed to do - and all round well designed hand tool for around 15 bucks. 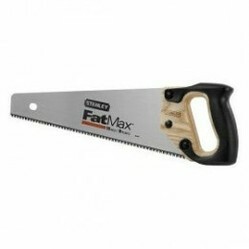 This hand saw is the comparable version of the previous product. The difference being the length is 20" and the blade is armor coated to protect it and create a longer shelf life. Whilst it's great for cutting up tree branches and limbs, it's just as useful around the home and garden in general. It's works just as well with wood stock as it does trees and garden related tasks. The blade works like the 15" - the saw action is smooth, doesn't catch or flex when in motion and the teeth are unbelievably sharp and quick acting. 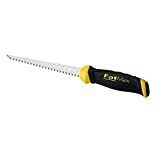 You'll be surprised how fast you can reduce a large fallen branch or cut up 2 x 4 - great but for around 20 dollars. This is the last of the best selling hand saws and again - it's a Stanley tool. This time a 26" blade that uses Stanley's sharp tooth technology - which delivers a faster, smoother cutting action. It works with wood, timber stock, plastic and laminate, and there's no denying it's ability to cut through anything that needs reducing in size. Despite the blade length it's rigid, no flexing - it just glides happily back and forth, doing the hard work and saving your back. The handle has a larger than usual opening and yes - you can get a good grip even if you're working with safety gloves on. All in all a well made, built-to-last saw that's versatile and well worth the price tag.